White Cloud Banner 6th Grade, China Air Force Wings 2 & 4 Star, China War Memorial Decoration, Two Distinguished Flying Crosses, Air Medal, Presidential Unit Citation Award, WWII Victory Medal, Asiatic Pacific Campaign Medal Three Star, Philippine Liberation Medal One Star. Fritz Wolf attended Shawano High School where he excelled in leadership, character and athletics including 1933 state basketball playoffs. In 1938 Fritz earned a Bachelor’s degree in Business Administration from Carroll College, WI where he became an all-conference fullback for three straight years. About this time he realized that if he was ever going to learn to fly, now was the time. In 1939, he enlisted in the U. S. Navy. Upon completion of flight training in 1940 Ensign Wolf was assigned to the USS Saratoga as a Dive-Bomber pilot. During his time at San Diego naval base, Fritz was chosen as one of the fliers to perform in “Dive Bomber,” a movie portraying Uncle Sam’s Dive-Bomber pilots before the war. In the summer of 1941 Fritz resigned his commission to join the AVG Flying Tigers. Like a lot of other pilots, he was looking for a little more excitement. 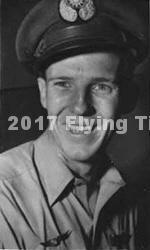 Wolf sailed in the first contingent of AVG pilots from San Francisco on July 6, 1941 aboard the Jaegersfontein. Fritz’s passport read “agriculture student.” The first month after Fritz’s arrival was spent learning Chennault’s tactics to fight Japanese pilots. On December 20, 1941, Fritz took part in the first Flying Tiger action near Kunming China, during which time he shot down two Mitsubishi bombers. On April 8, 1942, near Loiwing, China, Fritz took part in another action in which he shot down two fighters. On April 17, 1942 near Magwe, Burma, Fritz was caught on the ground when the Japanese bombed the airfield. Charlie Bond recorded in his diary that even Fritz Wolf was scared. During this raid, Fritz witnessed first-hand the tragic death of AVG Crew Chief John Fauth. Fritz was honorably discharged from the Flying Tigers when the AVG was officially disbanded on July 4, 1942. He had logged 220 hours of combat flying in the skies over Burma and China fighting the Japanese. Fritz returned to the Navy with the rank of Lieutenant, senior grade and assigned as fighter pilot instructor at the Jacksonville Naval Air Station in Florida. After training his own team, Fritz’s team was sent to Guam, assigned to the USS Hornet on January 8, 1945. Flying the Grumman F6F Hellcats, Fritz and his squadron struck Japanese targets in Hong Kong, Formosa, Hainan Island and French Indo China. While serving as skipper of VBF-3 aboard the Yorktown in 1945 and during the first naval carrier-based attack against mainland Japan, Fritz officially shot down his fifth Japanese plane making him an ace. Wolf closed the war at the Naval Auxiliary Air Station, Brown Field as executive officer. He left the Navy in 1946 to work for the Wisconsin State Aeronautical Commission. He remained in the Naval Reserves retiring as Commander in 1967. Fritz became the first paid employee in the new Wisconsin State Aeronautical Commission and later headed up operations there. Fritz was appointed the Wisconsin Director of Aeronautics and later became the Bureau Director of Wisconsin’s Dept. of Transportation. Fritz retired from state service in May of 1981 after 35 years of distinguished service. Fritz felt that this biggest role was the development of the state’s airport system that started with 32 public airports in 1946 to 103 public airports and more than twice that in private airports when he retired. Fritz Wolf was inducted into the Wisconsin Aviation Hall of Fame in 1989. On May 19, 2006, Wisconsin Governor Jim Doyle signed SB 306 which renamed the State Aviation Facility at the Dane County Regional Airport in Madison, WI, the Fritz E. Wolf Aviation Center. It was a fitting tribute to a man who dedicated his life to improving aviation in Wisconsin and the nation. -Contributed by Rick Wolf. For more information, contact Rick Wolf.